When the Blitz came to London on September, 7th 1940, Britain’s famous stiff upper lip was put to its most rigorous test, as the bombs rained down for 57 straight days. One place it remained fully erect was a stone’s throw from Buckingham Palace, at the Goring Hotel, which refused to close its doors throughout the war (or any war) in its 105-year history. No doubt this had something to do with the long standing respect from the Crown, who bestowed a Royal Warrant in 2013—the only hotel in the world so honored. 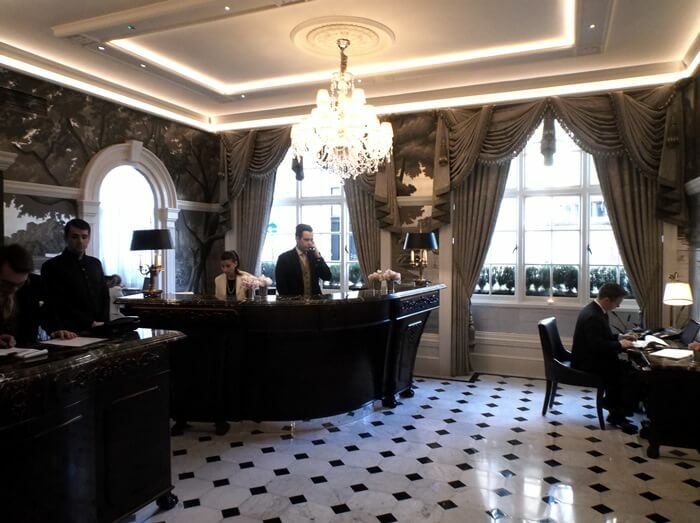 So when the Goring actually did bar the doors in January 2015, plenty of eyebrows raised. The culprit this time was not Luftwaffe bombers, but renovation, taking place from the inside out, beginning with dining room in 2005 and expanding to the rooms and common areas over several years. Last on the list was the reception lobby, which finally required the hotel to close. Behind closed doors, designer Russell Sage, transformed the space into something more playful than the previous incarnation, adding Gainsborough silks around the windows, new marble to the floor in the original 1910 style, a Georgian Chippendale-style front desk and most strikingly, hand painted wallpaper with hand-gilded silver leaf by Fromental depicting a sort of fantasy English countryside, replete with cartoonish animals representing members of the family and staff (hotel founder, Otto Richard Goring, is the walrus, goo goo g’joob), not to mention the royal lion and unicorn. Add in the royal footmen in top hats out front, and it was more than with a little timidity that I stepped through the doors on March 4th for a night’s stay. Certainly it had something to do with the pedigree of the surroundings, but also having been on the road for more than week, even my best Old Navy had a well-worn, rumpled look, further enhanced by spots of sweat from hauling my bag across London. Quiet panic ensued when the reservation could not be found. Quickly surrounded by hotel staff, I was escorted to the lounge to wait until the wires were uncrossed, which they thankfully were about 10 minutes later, with apologies, of course. 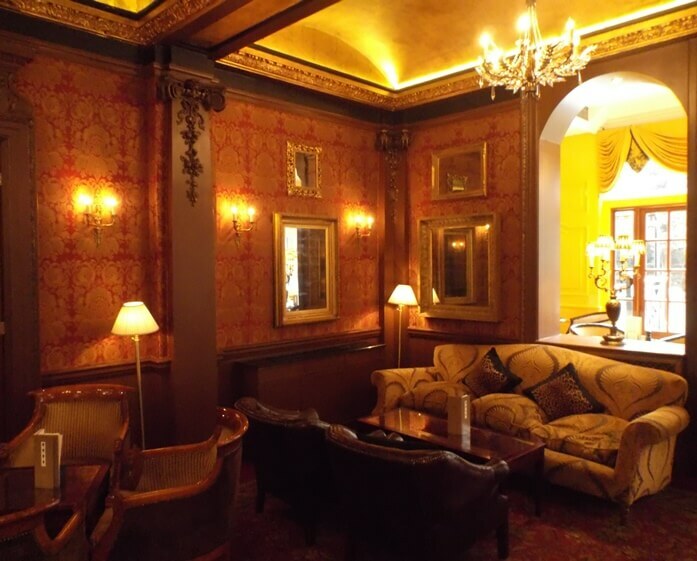 The wait, however, did provide ample opportunity to take in the lounge and the clientele, both of which seemed to feature no shortage of luxury fabrics and ruby color. Once more Gainsborough Silk, gold on burgundy, ravishes the most, but it gets plenty of help from carved marble fireplaces, crystal droplet chandeliers, and wingback leather arm chairs filled with dignitaries, celebrities, CEOs, and ladies who lunch, or dames, rather. With the reservation located, I was soon whisked to room 58 on the second floor (third in American) and led into a “most splendid room” (starting at about $600 per night) with the turn of an old school brass key. “Uh-oh” was my first response upon stepping in. 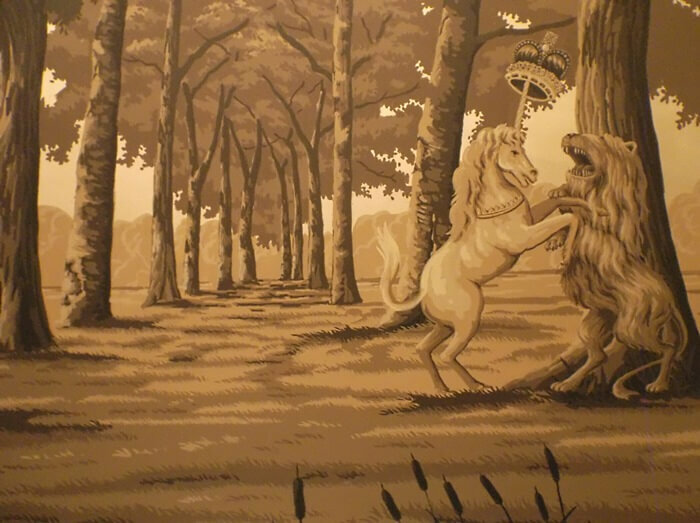 The most splendid room was also the most dangerous type: fabulous enough to dissuade any activity outside of it. 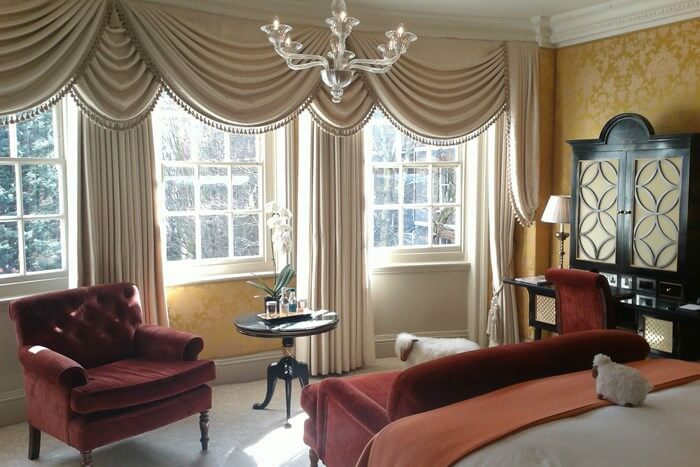 A short tour around the room reinforced the issue, unbelievably comfy Hypnos beds (also with a royal warrant), brocade yellow silk walls, Egyptian cotton bathrobes, mood lighting, and a view of the wide back garden, the second largest in central London (after Buckingham Palace). 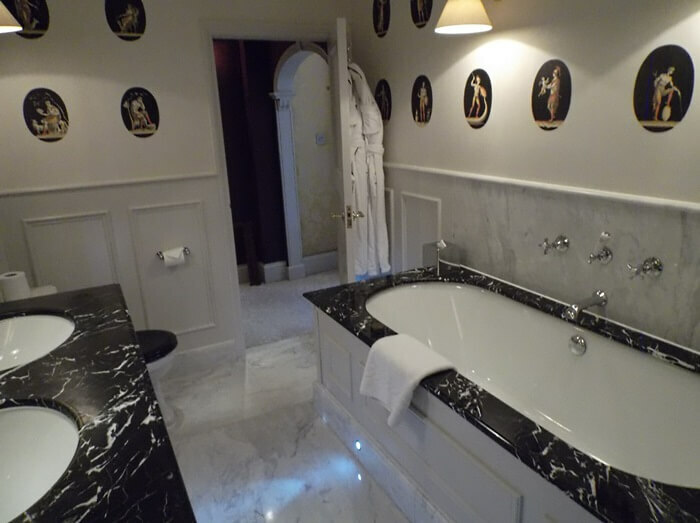 Stepping into the bathroom, however, sealed the deal, a panoply of swirling marble among a large walk-in shower, two sinks, Molton Brown bath products, oval Greco-Roman style figures along the walls, and the centerpiece, a tub amply large enough for a 6’ 1” 230-pound travel writer. The evening’s plans were immediately set. A tour of the hotel and renovations followed, revealing no less danger, beginning with the individually colored arched hallways on each floor, also wallpapered by Fromental, and extending into king, queen, and deluxe rooms, nearly all of which follow a unique layout (check ahead if particular), with suites adding sitting rooms, more bedrooms, and even a balcony. Indeed, it’s not hard to see why Kate Middleton and her family spent the night before the royal wedding here, and she returned to join the reopening celebrations (the night before me, actually). An evening soiree to celebrate the reopening of the hotel offered one more chance to show off my Old Navy gear among the Savile Row set, not to mention sip (ok, guzzle) fine Champagne administered by white glove butlers. Standing sheepishly in the corner of the downstairs Archive Room, and marveling at the somewhat nasal collective laughter of those with high pedigree and net worth, I couldn’t help feeling not just a fish out of water, but a fish on a bicycle. 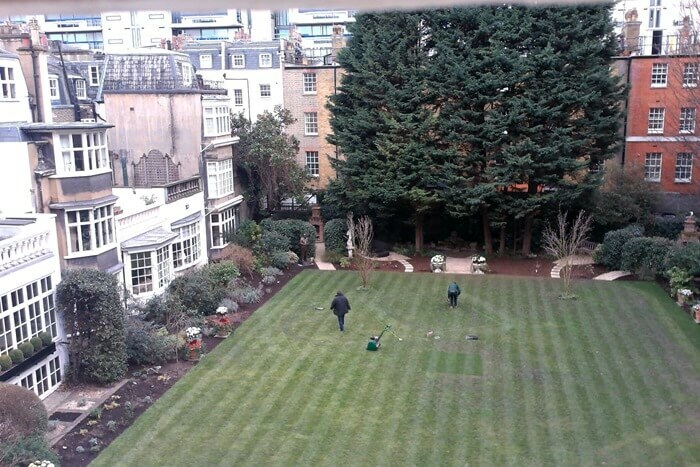 However I do give the Goring points for trying to assuage such insecurity. Ultimately, the desire to get back to water lured me back to the room, with the tub as bait. Naturally, it required at least one more glass of Champagne, which was topped off before heading upstairs. 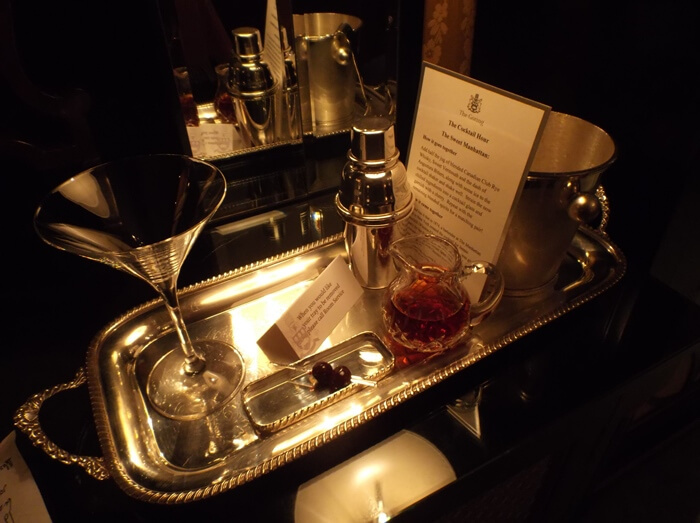 Perhaps the Goring had also thought of this, leaving a ready-to-be-shaken Manhattan cocktail, on silver tray, as well. As the tub filled, I tested out the lighting settings—bright, calm, cozy, and oooh. Going with cozy, (oooh seems better for lovers) I spiced the water with some Molton Brown, turned on some Lester Young, and slipped into absolute, utter, and total tranquility. The sleep that followed was no different, until the morning light through the bow window angelically coaxed me to consciousness the next morning. 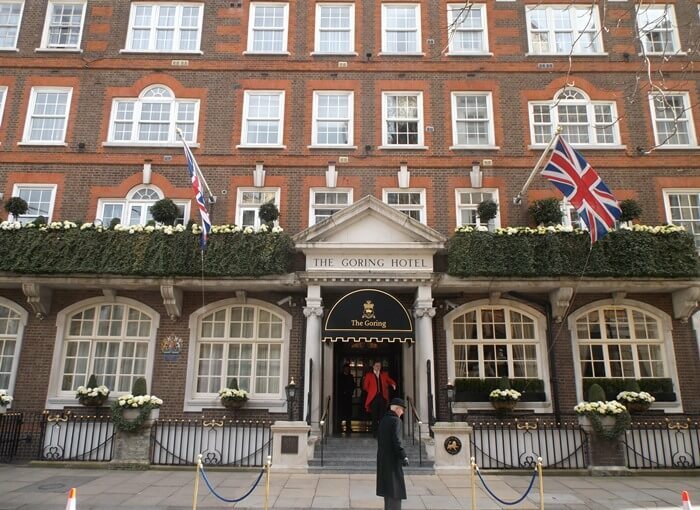 Of all the hotels I stayed in the UK on this trip (10 in all), the Goring was the only one I waited until the check-out time to leave. OK, the excellent breakfast in the sun-filled dining room did have something to do with it, but mostly it was resistance to leaving a place so obviously special. Undoubtedly, a night at the Goring is a significant splurge (although less than expected), but you do indeed get your money’s worth. Plus the encouragement to socialize, such as having to drop off your key with the concierge before leaving for the day, adds a subtle familial feeling, enough so that I did believe their expressed hopes at check out to see me again. Guess I should start working my magic on Pippa, who I hear has a thing for impoverished American travel writers in Old Navy. 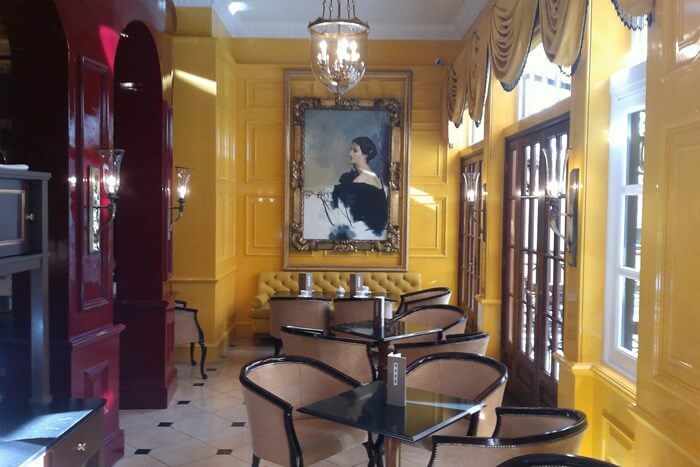 Make a reservation directly with The Goring or compare rates at Travelocity, Expedia or Priceline.